Orlando, Florida is one of the most fun destinations on the planet. 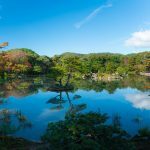 There is so much to do you could probably plan your Orlando itinerary and spend two months there and still not manage to do everything on offer. For our family trip we planned an Orlando 14-day itinerary, taking in the major parks and factoring in some essential days for relaxing, shopping and checking out Orlando’s smaller attractions. For some of our party, this was their first visit to Orlando so the idea was to see as much as possible in the time available. 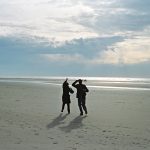 The age-range of our group was from eight-months to 63, and a mix of friends and family. Suffice to say, we all had a brilliant time! Planning your Orlando itinerary? You can view our complete guide to Orlando here. 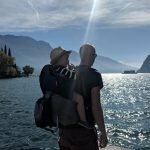 First time flying with your baby or toddler? 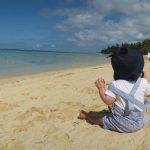 We answer questions about luggage, essential baby travel items, in-flight tips and how to have a stress-free flight here. Flights from the UK usually leave in the morning or early afternoon, arriving in Orlando between 3-7pm. We had a great flight on Virgin Atlantic and were staying at Universal’s Sapphire Falls resort. For this trip we had rented a car through Hertz.co.uk and the collection desk was in the terminal at Orlando International Airport and so the whole process was quick and speedy. (If you are not sure about renting a car in the USA you might find our post about driving, insurance and child car seats helpful). Once we had collected the car and loaded up our bags, we headed to the hotel, checking in early evening. There wasn’t much time to venture out and so we had a few drinks and some tapas at the Strong Water Tavern in the hotel and then headed to bed. TOP TIP: When you are collecting your currency for the trip, ask for some coins! Some of the toll road exits from the airport have automatic coin booths and if you only have notes you won’t be able to pay and you might end up with a fine. Mickey ears at the ready, we kicked off our 14-day Orlando itinerary at Walt Disney World. With only 2 weeks in Orlando, our plan was to start off strong and do two Disney parks in one day. Since we were up early due to jet lag, we decided to seize the day and be at the resort for opening time, which at Animal Kingdom was 9am. Disney’s Animal Kingdom seemed the most obvious choice to visit first because we also wanted to visit Magic Kingdom on day one and the famous fireworks over Cinderella Castle take place in the dark. Therefore it made sense to go to Magic Kingdom after lunch and stay until evening. (Magic Kingdom closed at 10.30pm). For this trip we bought Disney’s 14-day Ultimate Ticket with Memory Maker (£379 per adult) and got 14-days for the price of seven. 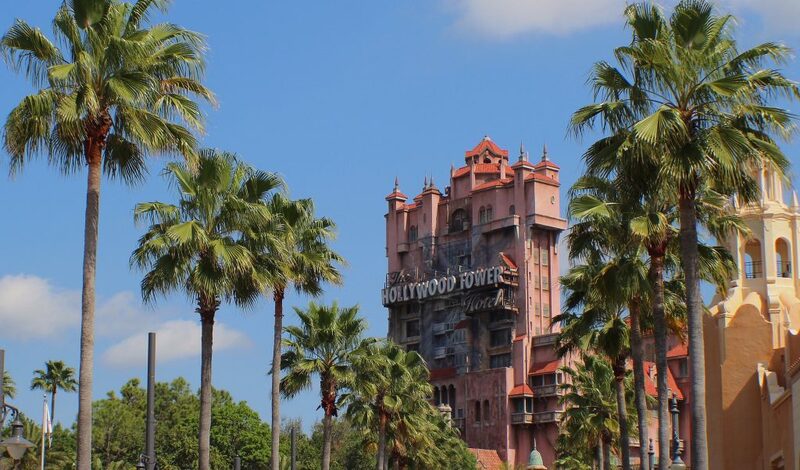 For help planning your own Orlando Itinerary and how long you need in each park, I have written a specific guide to Orlando Theme Park passes and how to find the best ones for your trip here. If you curious about what a ‘Memory Maker’ is at Walt Disney World, you might find this video handy! 9am: Arrive and park at Disney’s Animal Kingdom. We absolutely loved Animal Kingdom – everything from the general feel of the park, to the fun attractions and the excellent shows. If you are heading to Animal Kingdom for opening time, my advice would be to go straight to Pandora – World of Avatar and ride Flight of Passage because the lines for this attraction build up really fast and usually remain over two hours long for the whole day. If you only have 2 weeks in Orlando, you don’t want to spend a whole day standing in line! TOP TIP: If you booked your park tickets in advance you can actually reserve a time slot for the attractions using Disney’s FastPass+ technology. This is HIGHLY recommended for the amazing Avatar Flight of Passage ride. Find out more about FastPass+ here. Don’t miss: Avatar: Flight of Passage (4D ride) – possibly the best theme park ride ever, The Festival of the Lion King (show), Expedition Everest (rollercoaster) and the Kilimanjaro Safaris – we saw so many animals including a real lion actually sat on Pride rock! Don’t bother with: Dinosaur. The line was slow and the ride not much to write home about. Head straight to: Pandora – World of Avatar and work your way back toward the entrance. 3pm: Drive to Magic Kingdom. TOP TIP: Parking at Walt Disney World covers the entire resort and so if you move from one park to another you do not need to pay for parking again. The free Disney Transportation is also available to transport you between parks for free but since we planned to stay at Magic Kingdom until closing time we decided it made sense to have our car parked there ready to drive back to the hotel. I first went to Magic Kingdom when I was eight and every time I come back I am filled with all the happy memories from that holiday – my first ever time abroad. 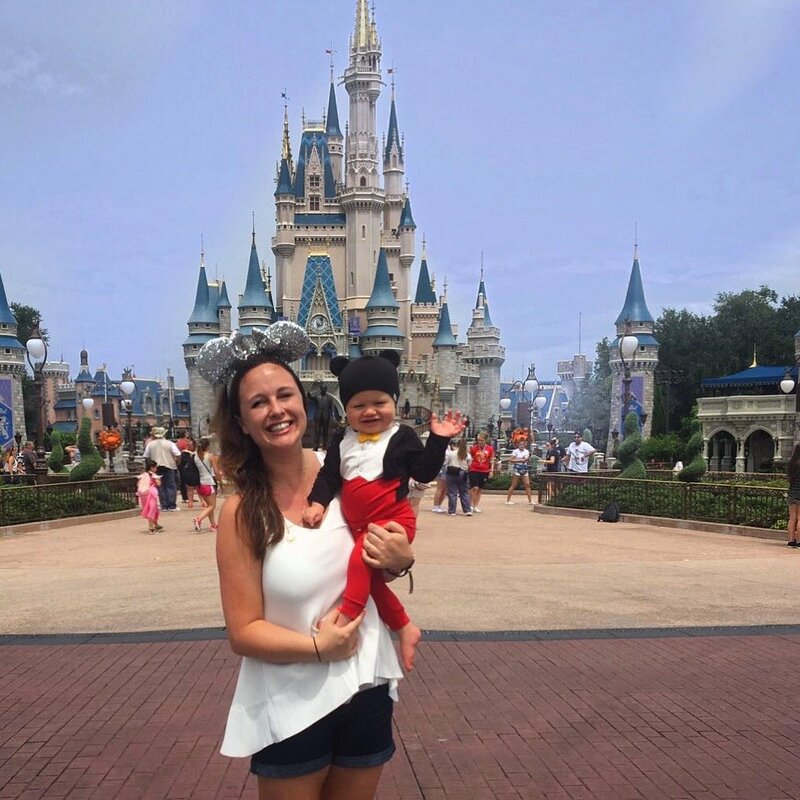 We had our baby Finn with us and, even though he will be too young to remember it, I absolutely loved being at Walt Disney World with him (dressed as Mickey Mouse, of course). From the jolly music playing as you walk down Main Street USA, to the happy cast members waving at you with the iconic castle in the background, I think the walk into the park is my favourite part of Magic Kingdom. This park is all about absorbing the Disney magic so enjoy the atmosphere and don’t be in too much of a rush to head straight to the rides. Don’t miss: Space Mountain (of course! ), Buzz Lightyear’s Space Ranger Spin and the Tomorrowland Transit Authority People Mover from which you can get amazing pictures of Cinderella Castle. I have chosen Buzz and the People Mover because despite not being the most famous or high energy rides in the park, they are both suitable for all ages and so our whole group got to go on together and Buzz was Finn’s first ever theme park ride. Head straight to: Splash Mountain. Lines can build up here over the day and it’s best to get splashed early on so you can dry off in the sun. 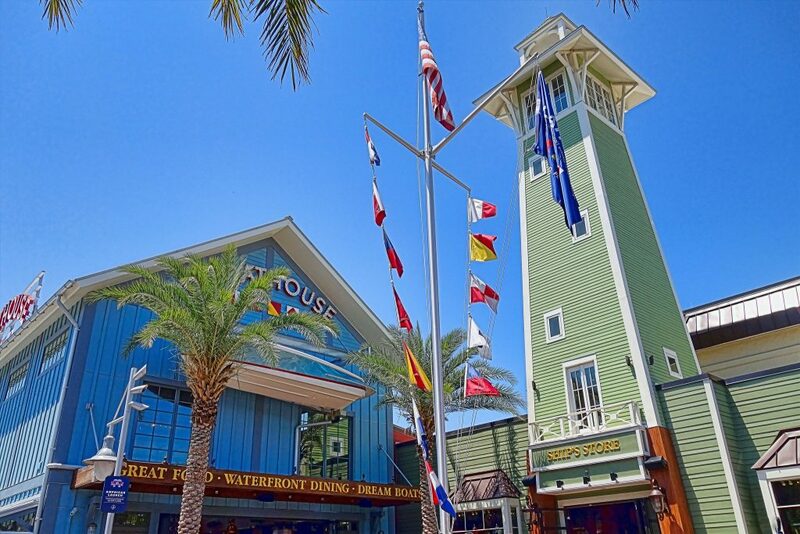 7pm: DINNER at the Columbia Harbour House table-service restaurant in Liberty Square. We probably would have walked straight past this restaurant if someone hadn’t recommended it but the food and service was great (I never expect either of these things at a theme park). There was a choice of healthy options (aka not just a plain Caesar salad as offered in the quick service restaurants) as well as nice seafood offerings such as grilled fish and lobster rolls. 9pm: FIREWORKS. The kids were getting sleepy by now but it’s definitely worth waiting for the Happily Ever After firework show over Cinderella Castle. 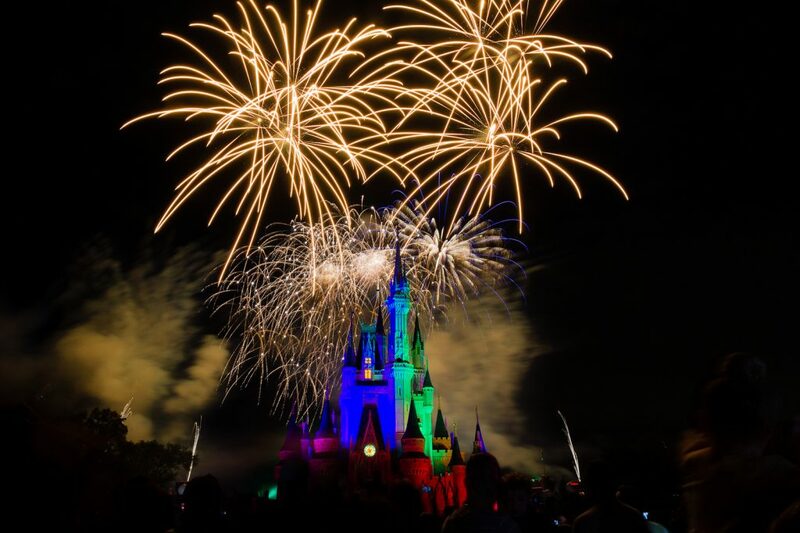 In your busy Orlando 2 week itinerary, you don’t want to waste time coming back to the Magic Kingdom if you can manage to do the park and the fireworks in the same day. Keep your eyes on the sky, you may even see Tinkerbell flying over your head… Crowds start to build from around 7pm but unless you want the premium spots, we’ve always arrived around 8.30pm and never had a bad view. We got a spot on the garden patio in Front of the Plaza Restaurant where we could sit on the floor to wait for the show to start and stay with our pushchair (eight-month old Finn was sound asleep by now). It really is a show like no other. Jet lag pretty much gone, we were buzzing when we woke up and couldn’t wait to get back to Walt Disney World. Today we indulged in a big breakfast at the Amatista Cookhouse in our hotel before heading to Disney’s Hollywood Studios for opening time at 9am. This used to be called MGM Studios and has always been one of my favourite Orlando theme parks. Like at Magic Kingdom, I just love the entrance to this park with the Hollywood-style roadways and props. 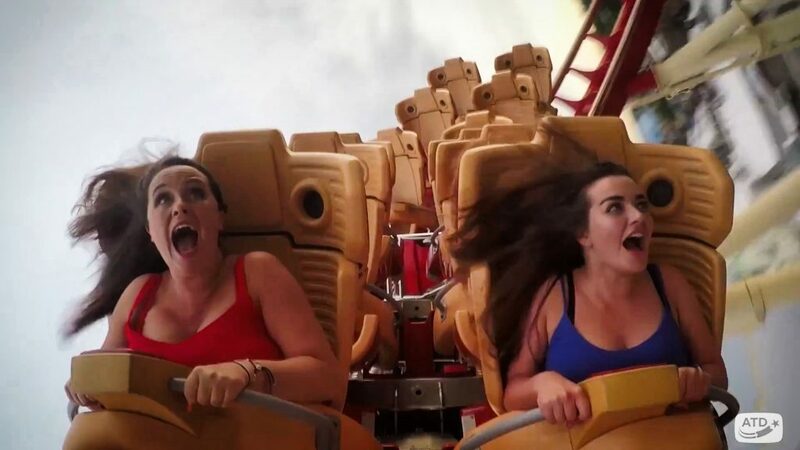 Being thrill-seekers, we headed straight to the high-energy rides, Rock n Rolla Coaster with Aerosmith and the Hollywood Tower of Terror which are adjacent to one another. Both also have a single rider line which is perfect if you want to run on again and don’t mind sitting with a stranger – although, despite skipping a 35-min line, by fluke I was sat in the same car as my dad anyway! Toy Story Land also opened here in Summer 2018 and has been ridiculously popular! There are also some smaller attractions at this park, such as the 100 Years of Disney Magic gallery (which I LOVED). If you are heading to Disney’s Hollywood Studios this year you will notice that a huge chunk of this park has been closed off. (The former Backlot Tour and the Great Movie Ride have been permanently closed, which I am sad about!) This is all to make way for the epic 14 acre Star Wars: Galaxy’s Edge land. Follow us on Twitter for all the updates and news of Star Wars: Galaxy’s Edge, which is opening in Autumn 2019. Don’t miss: The surprisingly brilliant Indiana Jones stunt show and Frozen’s sing-along celebration ‘For the first time in Forever’. Don’t bother with: Star Tours, which is a pretty dated simulator ride that will almost certainly close when Galaxy’s Edge opens. Head straight to: Toy Story Land (if you arrive first thing). If you arrive after midday, save this section of the park until later in the afternoon when crowds reduce. 3pm: For a change of scenery we decided to leave the park and head to Disney Springs, a huge shopping and restaurant complex that is part of the Walt Disney World resort. We had lunch at Frontera Cocina – an absolutely delicious Mexican restaurant owned by celebrity chef Rick Bayless – and then spent a few hours checking out shops that range from a huge Disney store (of course) to Zara, Superdry, MAC and Kate Spade. 7pm: Return to Disney’s Hollywood Studios. As the sun went down we headed back to the Studios to watch the incredible Fantasmic! show – my favourite of all the theme park entertainment in Orlando. 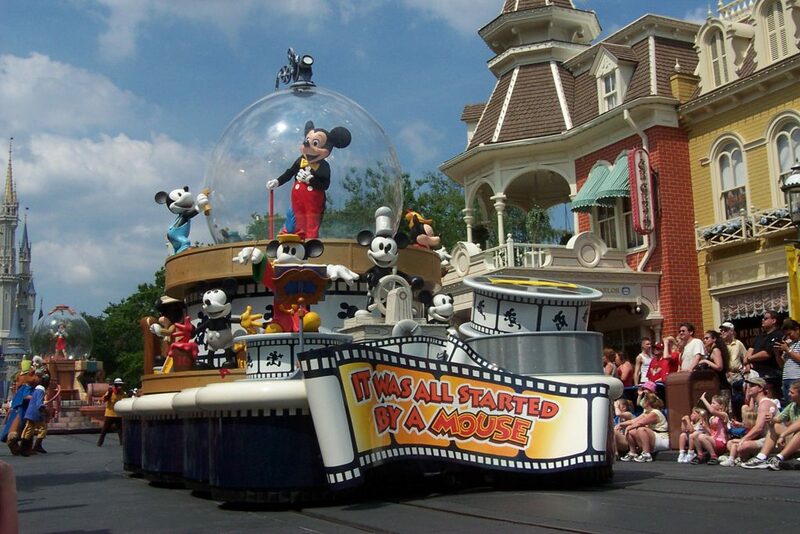 The epic production features boats, actors, special effects, fireworks and a few familier characters. The auditorium is pretty big so get there with enough time to get a seat (it does get full to capacity at peak times) but don’t worry about sitting near the front or in priority seating, so much goes on during the show you’ll have a good view from wherever you sit. Following this, immediately head to the middle of the park for Star Wars: A Galactic Spectacular projection show that rolls at 9:15pm. By now, we were pretty tired from pounding the theme park pavements and decided a rest day chilling by the pool at our hotel was in order. When recommending a plan for 2 weeks in Orlando, I always suggest rest days. 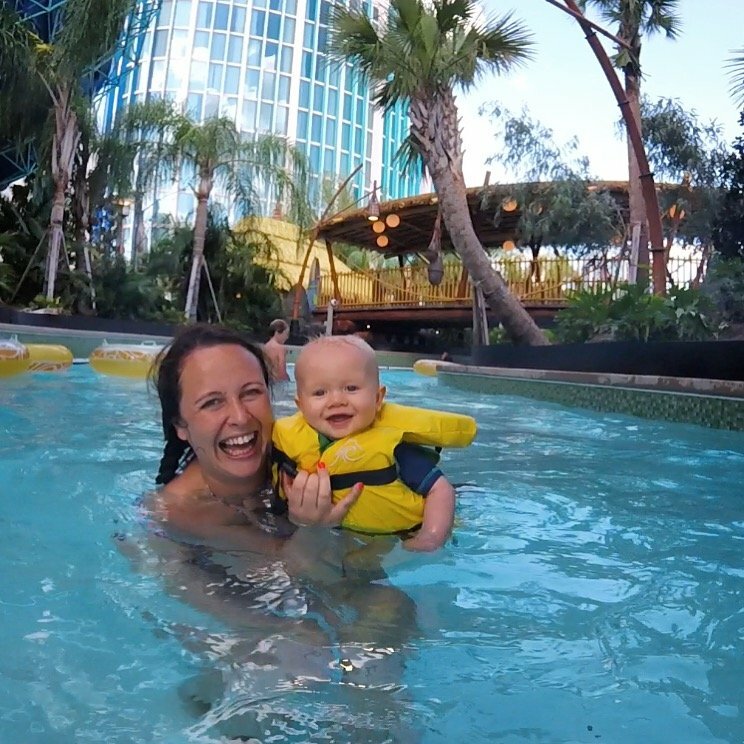 It’s easy to try and cram as much as possible into your Orlando itinerary but long days in the theme parks can be tiring and a pool day is just the medicine to recharge your batteries. As well as a huge pool with a slide, inflatables and ‘beach-style’ chill area, Sapphire Falls also has an outdoor restaurant bar, the Drhum Club Kantine, with full waiter service bringing drinks and snacks to your umbrella. We sampled more than a few colourful cocktails too! 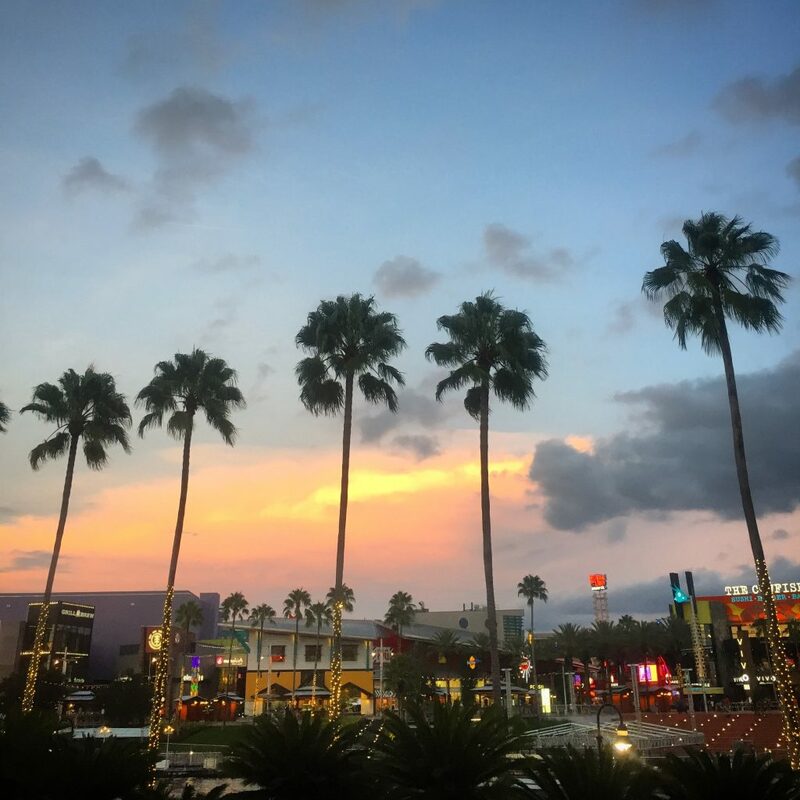 We stayed at Universal Orlando’s Sapphire Falls hotel but find out which of Universal’s eight hotels is best for your family or group here. 7pm: DINNER: We headed to the entertainment hub at Sand Lake Drive and ate at Rocco’s Tacos Tequila Bar (it’s more family-friendly than it sounds but the bar does serve some lethal cocktails to the over-21s and non-drivers!). Here, they make fresh guacamole at your table to your specifications, which in my case is less onion and extra limes, and the atmosphere is buzzing. 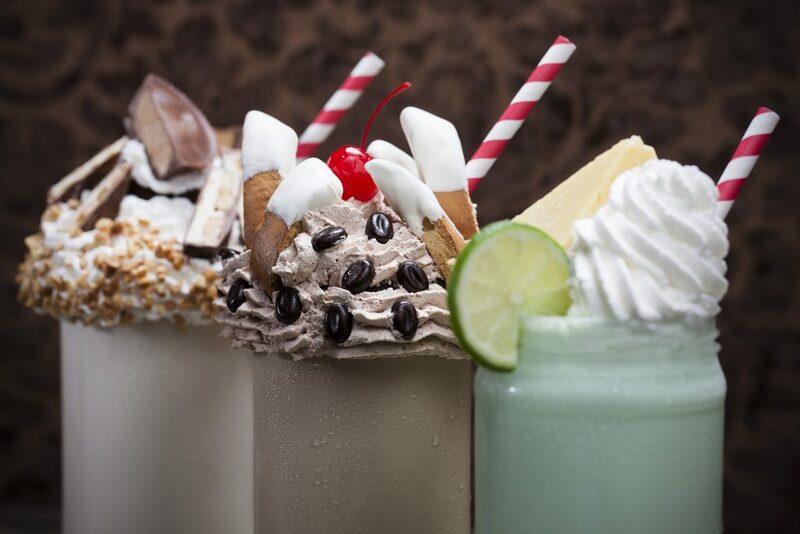 If you’re in Orlando without kids, this is also a fun place for a night out with a choice of bars and lively patios to party on. Are you following us on Facebook and Instagram? If you are finding my guide to 2 weeks in Orlando useful please support our social media channels as we love to stay in touch and hear about your trip, plus your support on social media helps keep our site up and running. If you are making a pin board for your top Orlando tips, we are also on Pinterest with our very own Orlando board. TOP TIP: Parking is free at Disney’s waterparks and at Disney Springs. 7pm: Drive to Disney’s BoardWalk. 7pm: In the evening, taking the advice of our Florida expert Debs, we headed to Disney’s BoardWalk. Because it looked fancy and we were caught up in the holiday vibe, we decided to have dinner at the Flying Fish restaurant. The food (mostly seafood) was good but the meal was rather an expensive one. After, we wandered around taking in the happy atmosphere and Prohibition vibes. 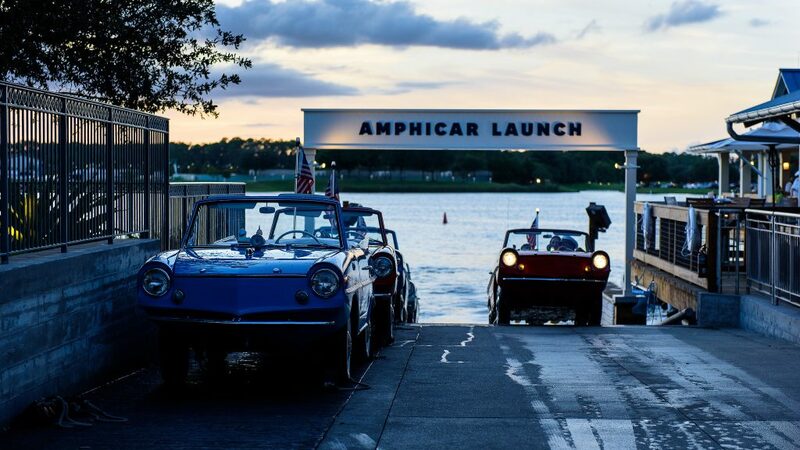 For something fun to do, you can take a guided tour in a retro amphibious car, which begins on land and drives into the water, transforming into a boat for a cruise around the lake. Very James Bond! ($125 for three people). Today, the weather had clouded over a bit and we decided to take it easy. We headed out for a quick and cheap breakfast at buffet restaurant Golden Corral. Popped into my favourite mega supermarket, Target (brilliant for kids clothes) and then spent a few hours at the slick Mall of Millenia, a huge shopping centre with everything from high street shops (Abercrombie and Fitch, Victoria’s Secret and Gap) to high end retailers like Jimmy Choo and Gucci. 2pm: LUNCH: We ate at my favourite US restaurant chain, P.F.Chang’s which is attached to the mall and has delicious Chinese small plates. Excitingly, we have just got a P.F.Chang’s in London, but when I am in Orlando I always make it my mission to go at least once. In the evening we stumbled across a cute tourist area called Old Town back along the 192 highway in Kissimmee. This was a strange mix of illuminated fairground rides and a bungee swing alongside a Western-style highstreet with funky shops and an imitation ‘small town America’ feel. 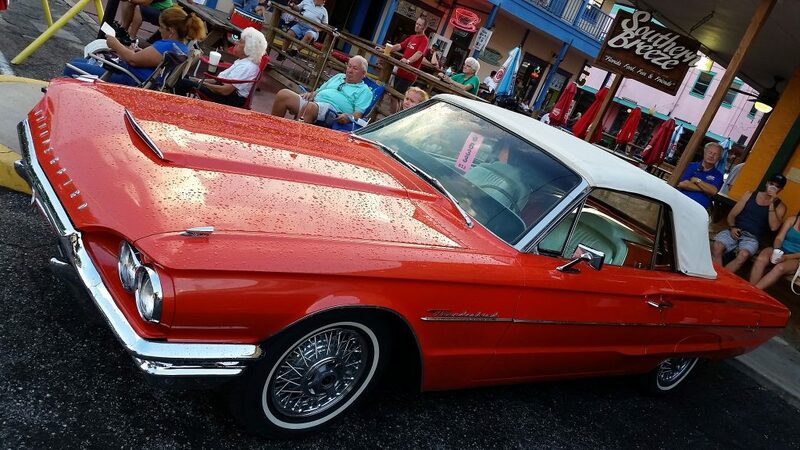 There was also a car show with classic 1950s and 60s cars on when we were there. People were dressed up in vintage clothing and there was live music and line dancing (Saturday nights only). It was an unexpected but really fun evening! 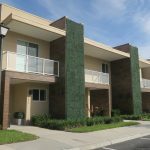 Read more about Old Town Kissimmee here, along with other fun Orlando attractions you can experience outside of the theme parks. 9pm: DINNER: Wanting a small snack before we went back to the hotel we grabbed a table at a small pizza restaurant in Old Town called Flippers and OH MY, this ended up being some really good pizza! Highly recommend for a cheap bite and they have a small outdoor terrace too. Pizzas start from $9. 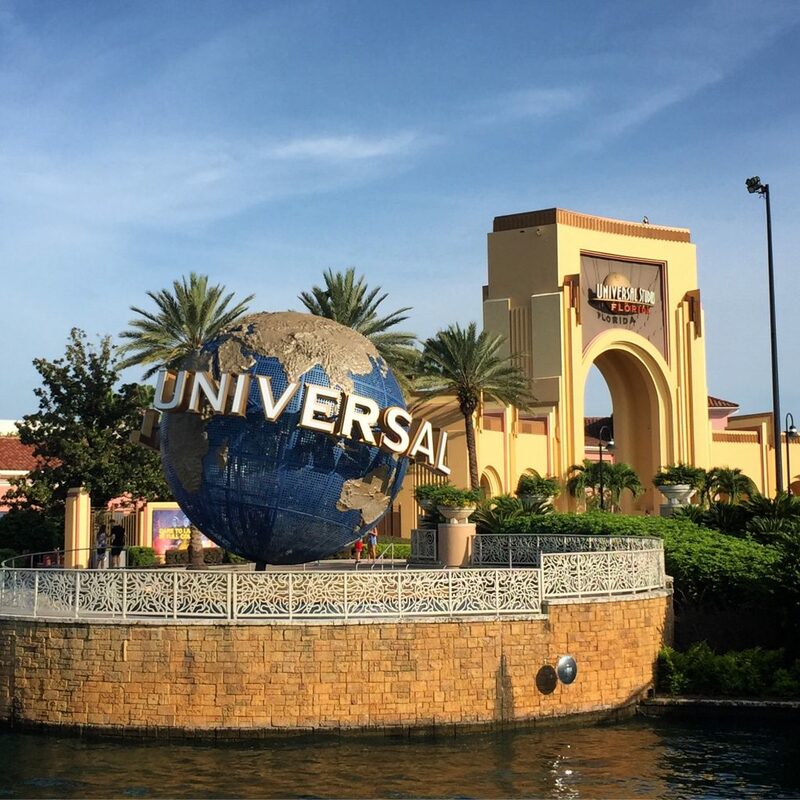 Having been staying on its doorstep for a week, it was finally time to head to my favourite theme park – and most important stop on my Orlando itinerary – Universal Studios! I first went to Universal Studios the year it opened (1990) when I was still at school. Even though they took away my favourite ride – Jaws – to make way for The Wizarding World of Harry Potter – I still think it’s the best park in Orlando. Of course, now the epic Harry Potter crew have moved in, the park is more popular than ever so during busy times a Universal Express pass is well worth the extra spend to skip a few lines. If you are staying at a premier Universal Resort Hotel (Hard Rock Hotel, Loews Royal Pacific or Loews Portofino Bay) you actually get this for free, meaning hardly waiting for any attractions, which is brilliant. For Universal Orlando, we went for the Three-park Explorer ticket (£235 per adult). Some of the ticket recommendations in this guide contain affiliate links so if you were to book your tickets by returning to my site and clicking through on these links I will receive a small monetary benefit at no cost to yourself. 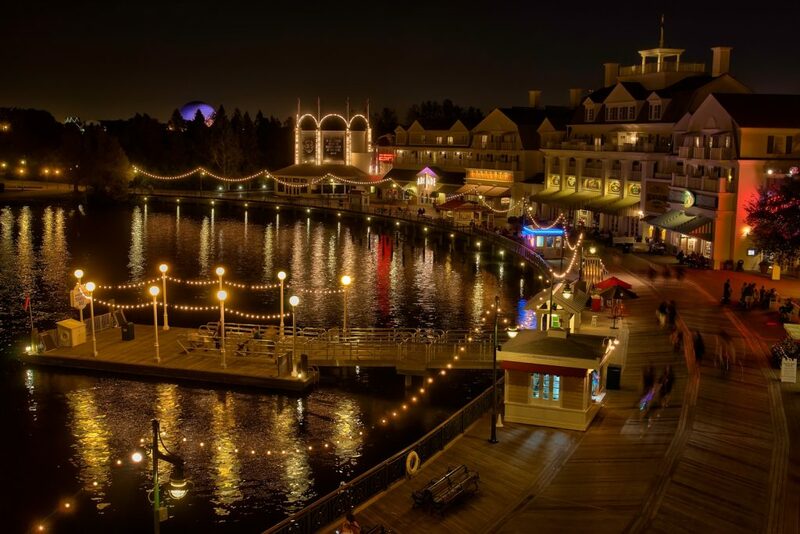 If you found this Orlando 14-day itinerary handy, please consider using this post to click through and buy your Orlando passes. 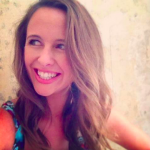 I was not paid to write this feature and, like all my posts on passportstamps.uk, this article is based on my true and honest experience. Don’t miss: Diagon Alley (and my favourite ride, Escape from Gringotts). Revenge of The Mummy, which is a very underrated ghost train-style rollercoaster and Jimmy Fallon’s Race Through New York. Many Brits wont know who he is and so might not bother with this ride but it was a surprise hit for us. There are a few in-jokes during the pre-show but the actual attraction (a simulator style ride) is brilliant. We loved it. Don’t bother with: I’ll probably get in trouble for saying this, but ET Adventure. The ride, which is the only one to survive from when the park opened in 1990, is tediously slow and in dire need of an upgrade. Shrek 3D is another time-consuming one I wouldn’t bother going on again. 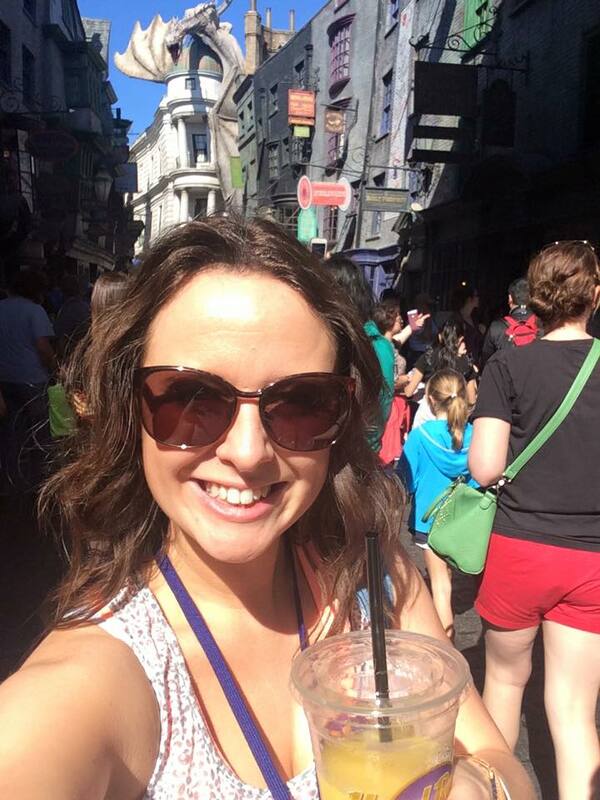 Head straight to: The Wizarding World of Harry Potter, Diagon Alley. So cliche but if you are in the park early it is best to dash straight there and get a look at the colourful streets before they become packed with tourists. Of course, staying at a Universal Orlando hotel also means you can take advantage of Early Park Admission and be inside the park an hour before regular guests. Don’t go straight on Gringotts but, instead, head inside Ollivanders and during an interactive experience a wand might ‘choose you’. Then, after that go immediately to Gringotts, of course. TOP TIP: Muggles can buy interactive wands to use in both Universal Studios and Universal’s Islands of Adventure. By following a specific sequence of wand-waving detailed on gold plaques around the park, you can make magical things happen. Wands start from $47 and can only be purchased within The Wizarding World of Harry Potter. 2pm: LUNCH: We ate at Mo’s Tavern in Springfield (The Simpsons area), which inside is a mini food court serving different options, so ideal for a big group. There are lots of indoor and outdoor seating areas but the aircon was gratefully accepted as we were so hot! I made sure to save room as there was no way I was going to miss out on a giant Lard Lad Doughnut for dessert. 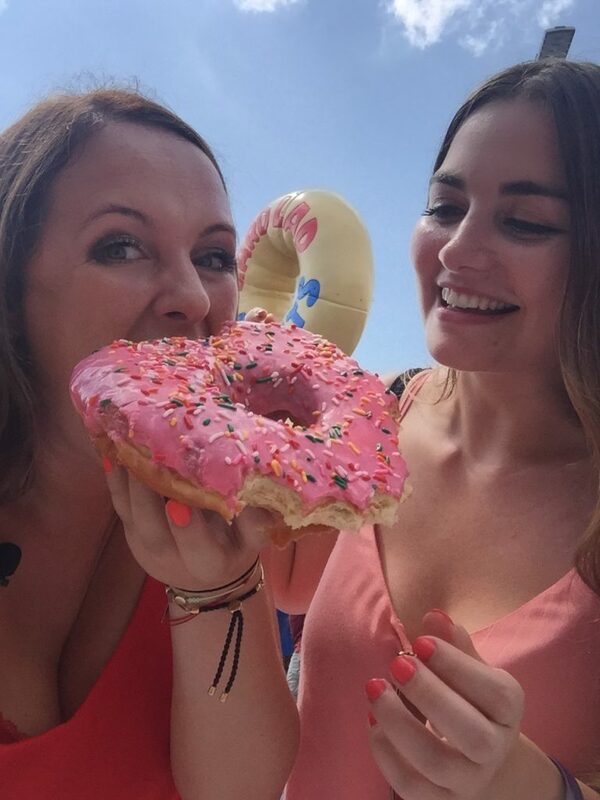 The doughnuts are as big as your head! TOP TIP: We had a 14-day unlimited ticket which meant we were able to move between Universal Studios and Universal Islands of Adventure free of charge on the Hogwarts Express train. This is explained in my which theme park tickets to buy post. After taking the train from Kings Cross to Hogsmeade, we could have easily dashed off into the adjacent theme park (Islands of Adventure) but since we had set aside a whole day for that later in our two-week Orlando itinerary, we just stopped for a quick Butterbeer at Hogsmeade before heading back to Universal Studios for the rest of the afternoon. 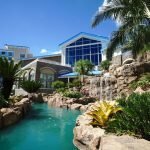 Staying in Orlando with family? 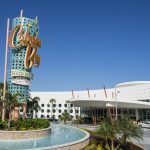 Read our honest review of Universal’s Cabana Bay Beach Resort. While you are at Universal Orlando – have you heard of the ‘Walls of Universal’ game? Find out more and how to play here. 8pm: DINNER: Before heading back to our hotel we had a wander around CityWalk which is walking distance from the park entrances and an easy water taxi ride from our hotel. We found CityWalk really lively and it has a younger, more ‘party’ vibe than Disney Springs. We ate at the delicious The Cow Fish – as recomemeded by Florida expert Kate on our INSIDER TIPS post. It’s a strange mix of burgers and sushi but somehow it works and the quality of food is top notch. Another good hangout is the Pat O’Brians Piano Bar, which is actually a replica of an Irish pub in New Orleans, famous for inventing the Hurricane cocktail. Throw a couple of dollars in the jar and these guys will play any song you want – although most nights it’s the usual Ed Sheeran or Billy Joel (Piano Man) that people end up asking for. Note that after 9pm, the bar becomes over-21s only and so younger guests have to go home to bed. This was a great day because Universal’s Islands of Adventure is my dad’s favourite theme park. 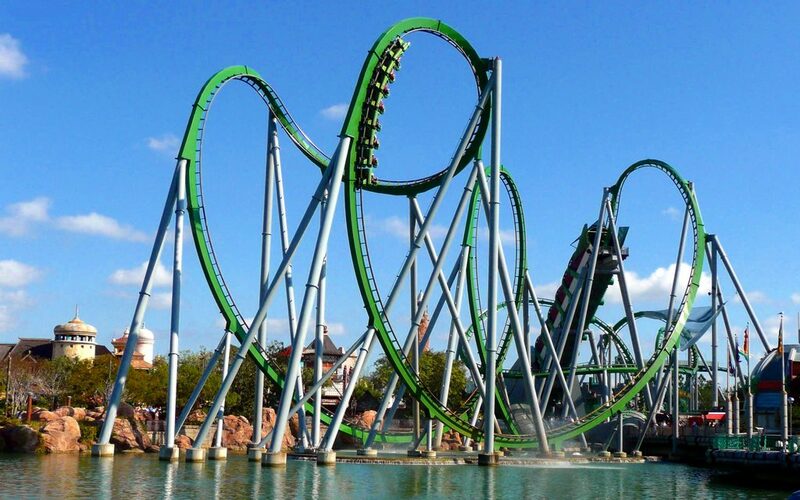 If you like a thrill ride, this park does have the most scream-tastic ones – starting with the revamped Hulk Coaster, of course! This park has so many great attractions, including some of my favourites – The Adventures of Spiderman and Jurrasic Park River Adventure. 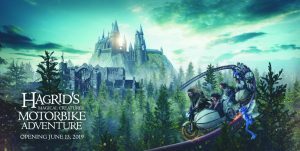 Plus, Harry Potter fans can of course make the pilgrimage to Hogsmeade and the dramatic Hogwarts castle to ride Harry Potter and the Forbidden Journey. Don’t miss: Popeye & Bluto’s Bilge-Rat Barges (but BEWARE you get absolutely drenched), The Amazing Adventures of Spiderman. Don’t bother with: Storm Force Acceleration, a pretty basic spinning ride. Head straight to: Again, if you are in the park early doors (or, even better with Early Park Admission) it’s best to head straight to Hogsmeade before the legions of Harry Potter fans descend. 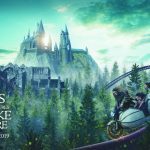 Here, you can ride the BRAND NEW Harry Potter roller coaster, Hagrid’s Magical Creatures Motorbike Adventure (from June 2019). Then, work your way back through the park, starting in the Jurassic Park area and walking toward Kong and Marvel Island. 1pm: LUNCH: This park is too big to have time for a table-service lunch so stop to refuel at The Burger Digs in Jurassic Park. A quick-service restaurant but lots of seats and an educational area for any dinosaur fans in the group. The chicken burger and fresh salad bar were above average for theme park food. Don’t miss the incredible Nighttime Lights at Hogwarts Castle on selected evenings at Universal Islands of Adventure. 9pm: Absolutely knackered from our two-day Universal adventure (clocking up over 30,000 steps), we headed back to the hotel for room service and an early night. Before it became the theme park capital of the planet, Orlando was really just marshland and orange trees. 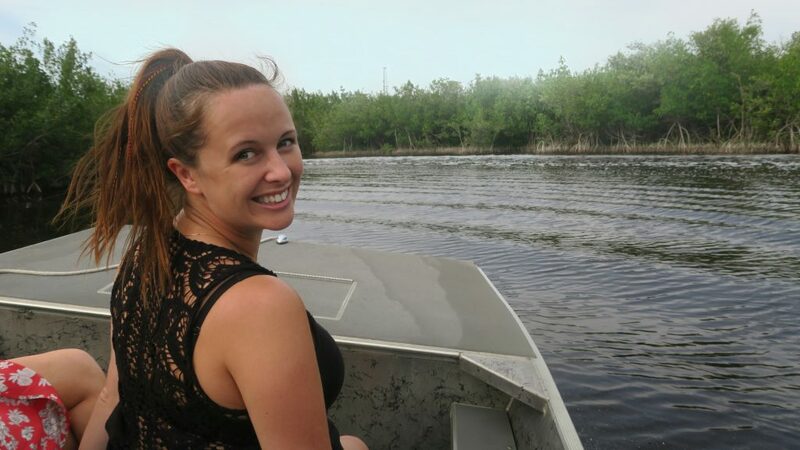 To get an idea of what that must have been like, we took an (unexpededly thrilling) ride on an airboat across the Everglades with Boggy Creek adventures. This specific tour had been recommended by a friend and so we had booked our tickets before arriving in Florida. The Boggy Creek one-hour scenic tour is £28 per person. 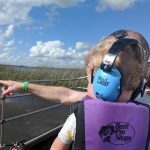 This post on alternative Orlando attractions outside the theme parks has a more detailed review of Boggy Creek Airboat Rides. 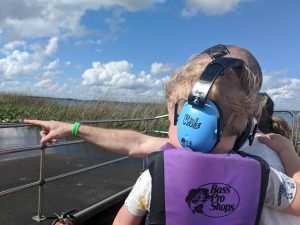 This video from one of our Florida adventures has some of Orlando and Miami’s highlights, including our brilliant airboat ride with Boggy Creek Adventures. Alternatively, you could check out Gatorland- an Orlando attraction that has been in operation since 1943. As well as over 10,000 alligators, Gatorland is a huge wildlife park with a variety of animals and experiences. 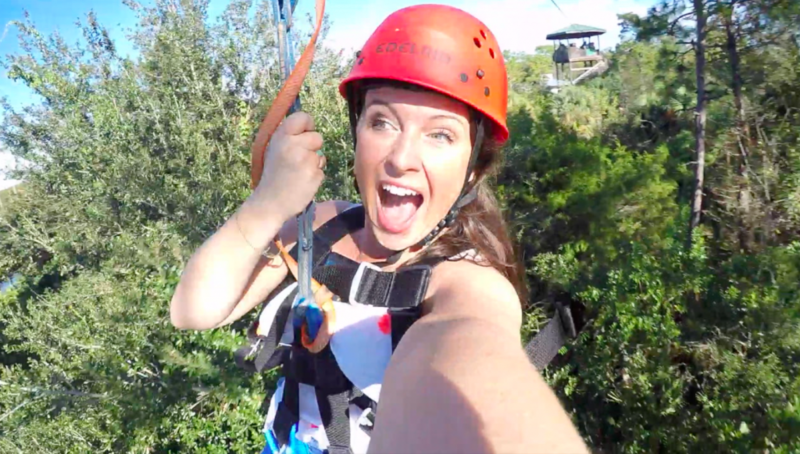 This is also where you can Zipline Orlando – right over the alligator enclosure! We had a brilliant day here and it was one of the highlights of our trip. Then it was back to the hotel for some essential sunbathing and pool time. When planning your two week Orlando itinerary, don’t underestimate how much rest time you will need. Trust me, the weather in Florida can be hot and humid and you will do a lot of walking and travelling between the hotels and parks. 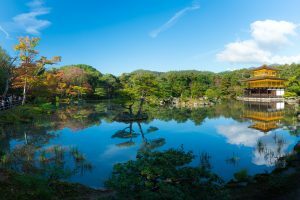 Taking days to relax might seem like a waste of precious holiday time when you are at home creating a plan of action, but once you get there you will be grateful for a few breaks. According to our FitBit, we were averaging around 15,000 steps a day. If you do get restless sitting around, the 14-day unlimited tickets mean you can head back to the parks for a few hours whenever you feel like it. 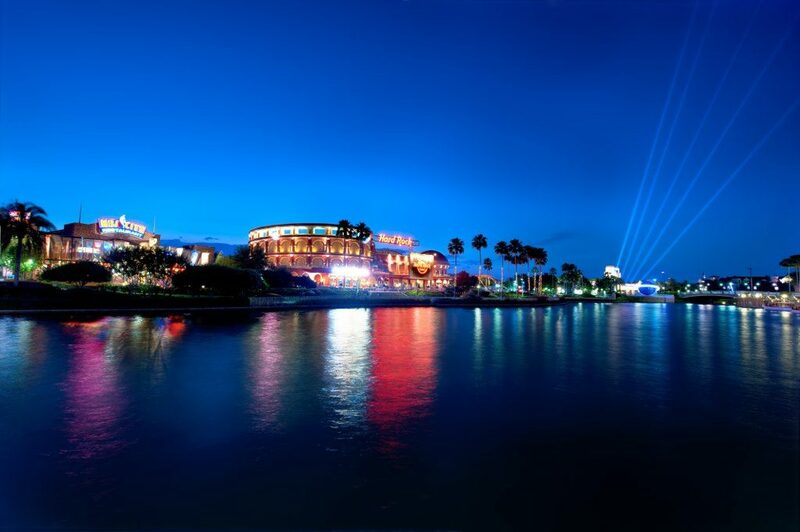 In the evening, head to International Drive, an entertainment area with restaurants, amusement attractions and bars. 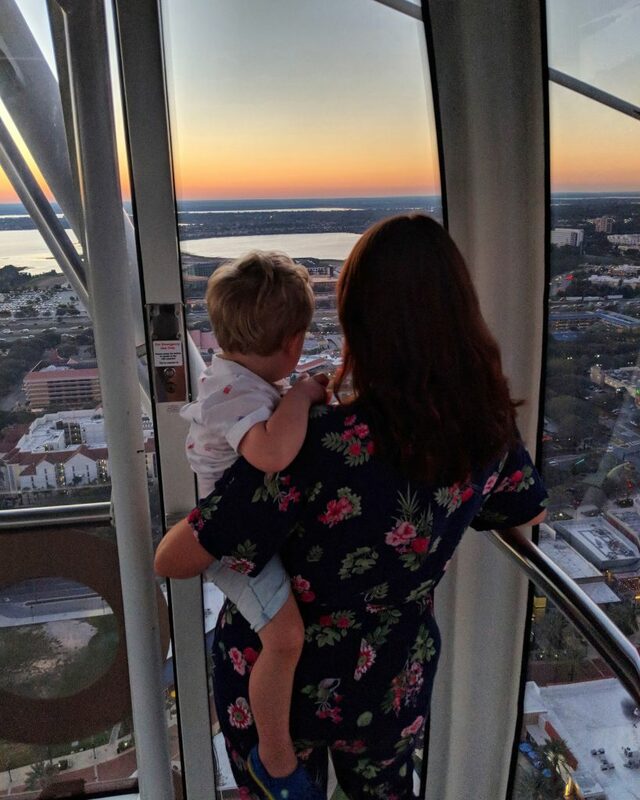 Aim to arrive just before sunset at take a Champagne Flight on the epic Icon Orlando 360, a 400ft Ferris Wheel that offers panoramic views across Orlando. During the day, you can see across Walt Disney World and all the way to the coast, but I loved it at sunset when Orlando was bathed in a beautiful orange glow. Kids under 3 travel for free. Read a more detailed description of our trip on the Icon Orlando 360 here. For some revved up fun, also check out the NASCAR I Drive Experience, indoor go karts on International Drive. There is no age limit but children do need to be at least 55 inches in height to drive. Need ideas for somewhere to stay outside the theme parks? How about this cool complex? Since we could see the towering Volcano from our hotel room, heading to the brand new Volcano Bay water theme park was extra exciting from all the anticipation. The park, which is the newest waterpark in Orlando, has a colourful tiki theme with 14 slides, two lazy rivers, a splash zone for kids and a huge wave pool and beach. Dare you to try the Ko’okiri Body Plunge, a 125ft drop after a floor gives way beneath you. Terrifying. My favourite slide was probably the Krakatau Water Coaster (a boat ride) because I had never been on anything like that before. And as always, I loved the lazy river. Volcano Bay has a type of Express Pass called the TapuTapu, which is in the form of a waterproof watch you are given for your day at the park. The advertising says you can link this with your bank card and use it to pay for food and merchandise throughout the day, leaving your valuables secure in a locker. But apparently some overseas cards won’t connect with their system so, being from the UK, we weren’t able to do this. You can also use the TapuTapu to scan in for an express pass entry to some slides but we didn’t quite manage to get it to work at the right times and so to be honest, we didn’t utilise it much. Did you know you can walk to Universal’s Volcano Bay water theme park from the brand new Aventura Hotel? There is also a pretty epic roof top bar! We headed back to the hotel to freshen up and took the free water taxi from our hotel to CityWalk. Arriving by boat into the dock, surrounded by neon signs, palm trees and music playing feels very glamorous. After only snacking on pool snacks and fast food at the waterpark, we had worked up a huge appetite and so headed to Vivo Italian Kitchen for some really delicious food. Considering the restaurant is inside the theme park bounds, I wasn’t expecting such a good quality meal. Portions were generous (as always with the USA) but the squid ink pasta and chicken marsala were the highlights. 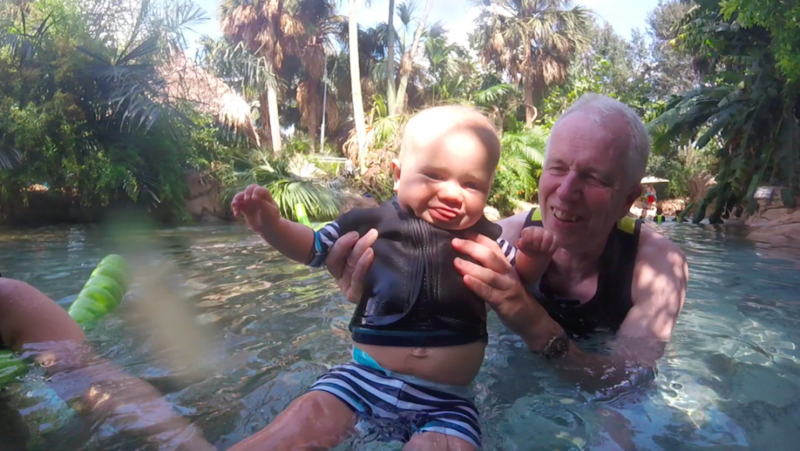 This is the other of my dad’s favourite parks and with a young baby in tow we were really looking forward to visiting SeaWorld where Finn (and the non-rollercoaster fans) of our group could all enjoy the park together. Of course there is the much-talked about Killer Whale show, One Ocean, but we were actually more excited to see the smaller animals such as the turtles, stingray (which Finn could touch) and sea lions. There is also a Manatee rescue centre where vets at the park take in injured or sick manatees from around Florida and rehabilitate them before releasing them back into the wild. There are a lot of educational aspects to SeaWorld, which is great for kids. Exhibits showing the effect of dumped plastic in the oceans were pretty thought-provoking. Unsure about the SeaWorld parks? Watch our video here. The highlight of the day was in the afternoon. 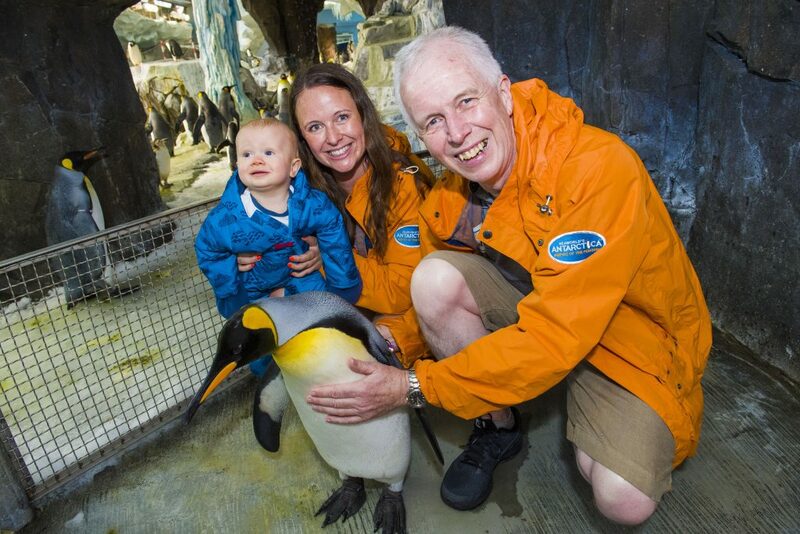 Finn loves penguins and so we had pre-booked a Penguin Up-Close experience where he got to meet one of the little guys face to face ($60/£50 per person). He loved it but I think my dad and I were the most excited! 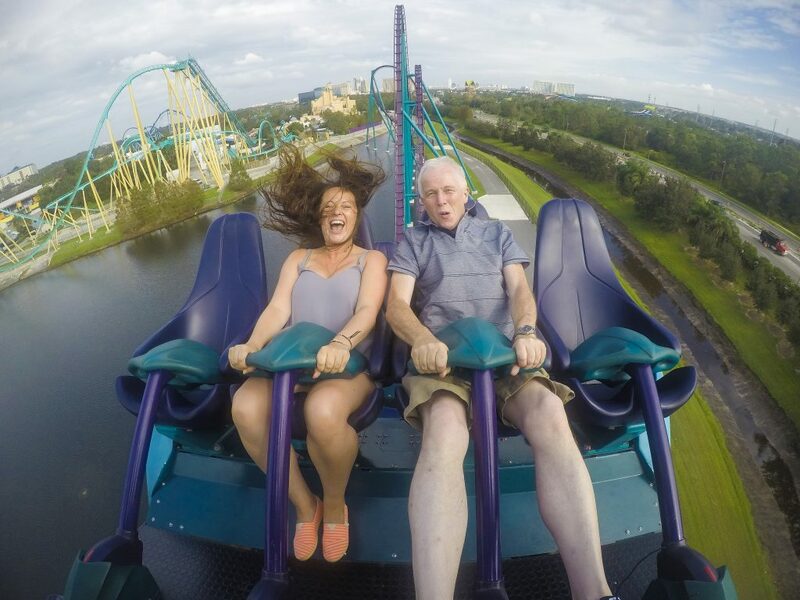 Thrill riders wont be disappointed either as SeaWorld is surprisingly home to the fastest, tallest and longest rollercoasters in Orlando. Mako, which I reviewed on opening day in 2016, was a favourite and my dad also made us ride Manta at least seven times. 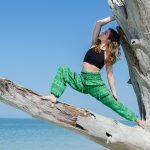 Don’t miss: Manatee Rescue and Rehabilitation Facility, the Empire of the penguins area, Mako and The dolphin nursery (to see playful baby dolphins interacting with trainers). Don’t bother with: Wild Arctic (Just another simulator ride and the real animal areas are much more fun for families). Head straight to: Infinity Falls. I have to admit, water rides are never my favourite but this is a brand new water coaster with a serious drop and it was a brilliant experience. Start here as lines do build up over the day. Plus, it is in the corner of the park so you can work your way back to the gate (and Mako) when most of the crowds will be heading the other way. 5pm: DINNER: As we were celebrating my dad’s birthday at SeaWorld, we booked in advance to have dinner at the Shark’s Underwater Grill, a table-service restaurant that is actually inside the aquarium. Food was good but the setting is the best part with the kids thrilled to be having tea ‘underwater’. If you want a break from the theme park resort restaurants and bars, try the Crooked Can Brewery at Plant Street Market. This locals haunt in Winter Garden has craft beers and a friendly atmosphere. Read more about non-theme park Orlando attractions here. Day 12 of our Orlando 14-day itinerary and we still had a few days left on our 14-day Walt Disney World ticket and so today we headed back to explore Epcot. This is such a fun and eclectic park with something for everyone. It’s a strange mix of sci-fi rides and a celebration of different countries all replicated around a huge lake in the World Showcase. 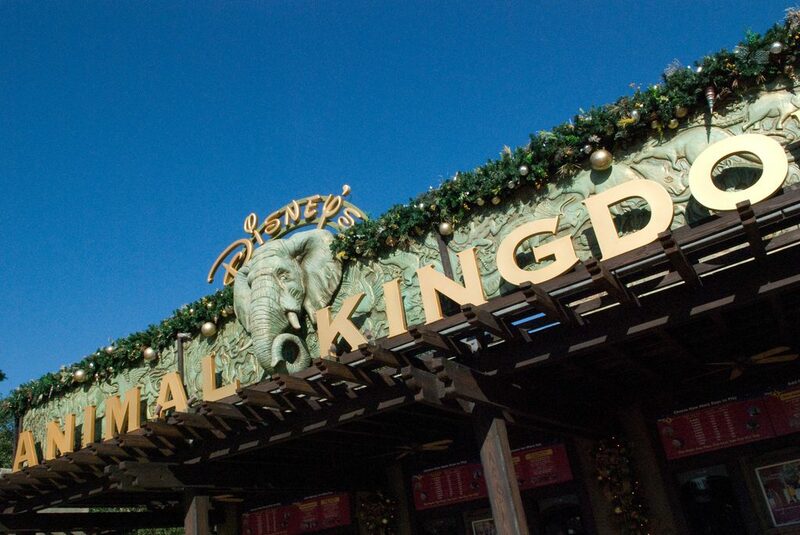 Plus, this park is also home to many of the famous ‘Walls of Walt Disney World’ – find out more about that here. Don’t bother with: Mission: Space – gave me headache. 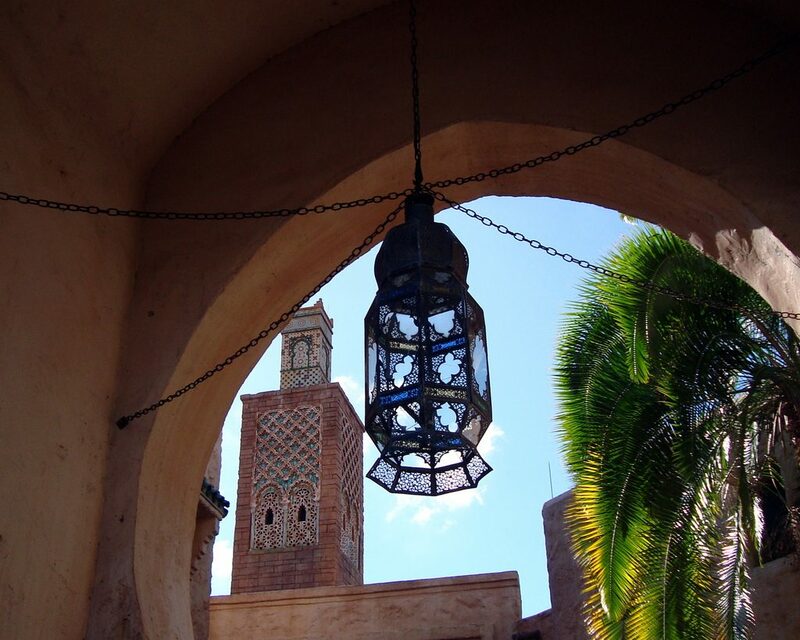 3pm: LUNCH: Based on a heap of recommendations, we ate at Restaurant Marrakesh in the Morocco Pavilion, which is probably the most beautiful of all the ‘countries’ at Epcot. Morocco’s King Hassan II actually sponsored the building of the pavilion and sent workers from Morocco to create it in 1984. The food didn’t disappoint either but picky eaters might struggle to find something. 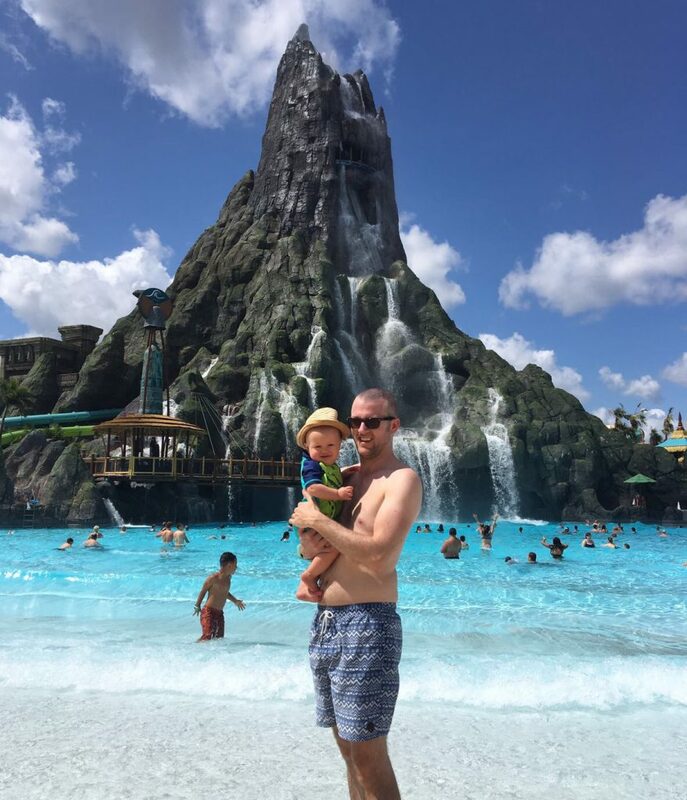 The sunny weather was just screaming ‘waterpark’ and so we were up early and headed to Aquatica, the brilliant park that was included in our SeaWorld Discovery Cove Package. (£227 per adult). I loved Aquatica which has a young vibe, pop music playing throughout the park and lots of quiet areas to set up base for your group. 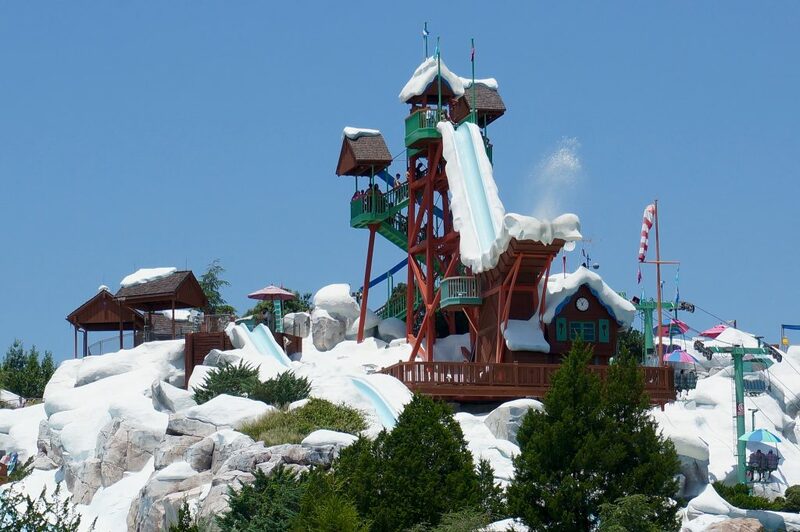 Probably the most anticipated slide was the Dolphin Plunge, where your tube actually goes through the Dolphin pool in a glass slide. My favourite area was the Walkabout Waters kids zone which had every hose / fountain / bucket feature and waterfall you could think of and kept the kids busy for hours! 2pm: LUNCH: To make life easy, we got the All Day Dine package at Aquatica which meant we could eat for free whenever we felt peckish and the different tastes and meal times for our group were all catered for. 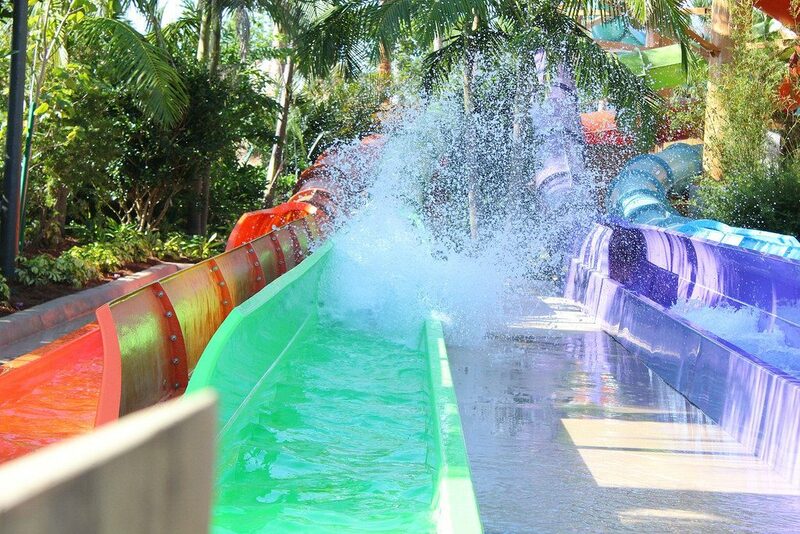 TOP TIP: Invest in the Quick Queue ticket at Aquatica. It’s the cheapest one we found in Orlando ($19) and was well worth it. We didn’t stand in line for anything all day. Now for some shopping therapy! Even though the pound isn’t quite as strong against the dollar, shopping is still a big deal for Brit tourists in Orlando – us included. It goes without saying a good look around a shopping mall had to squeeze into Orlando itinerary two weeks plan. Our favourite discount shopping outlet was the Orlando Premium Outlets at Vineland. We left Aquatica and headed here for the early evening (it is open until 10pm). 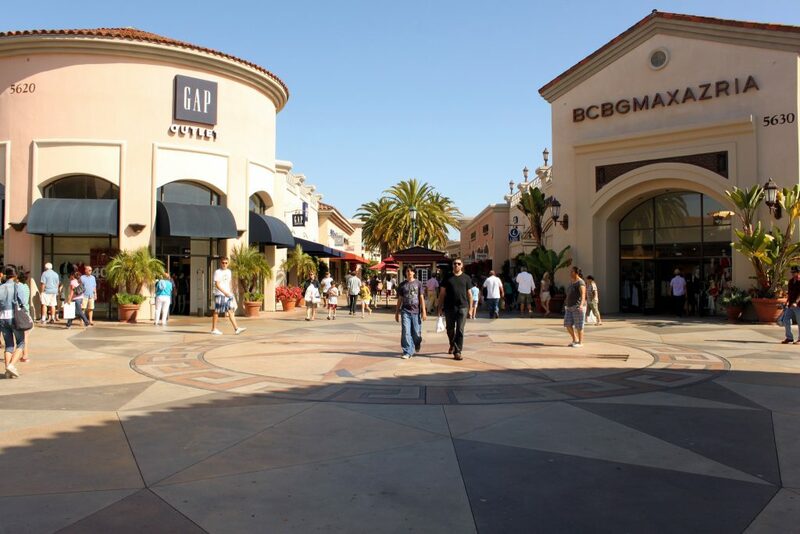 Shops range from Nike, Sunglasses Hut, Levi’s, Kate Spade and Coach. TOP TIP: Extra discounts are available from Guest Services if you sign up in advance on the website and there are some really good deals. Just remember your suitcase – taking it all home must weigh less than 23kg! If you would rather check out a more authentic Florida town and shopping area, head to Park Avenue in Winter Park. A classic and pretty American town with boutique stores and local businesses as well as some great dining and nightlife options. 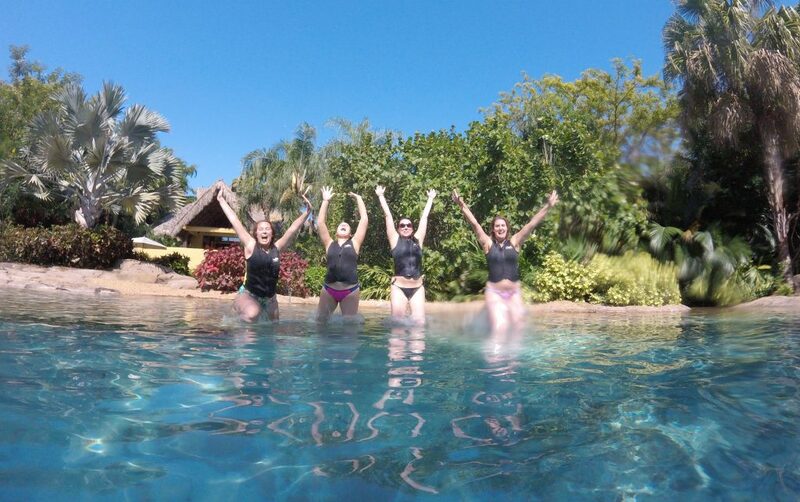 Discovery Cove was the most refreshing end to our trip! 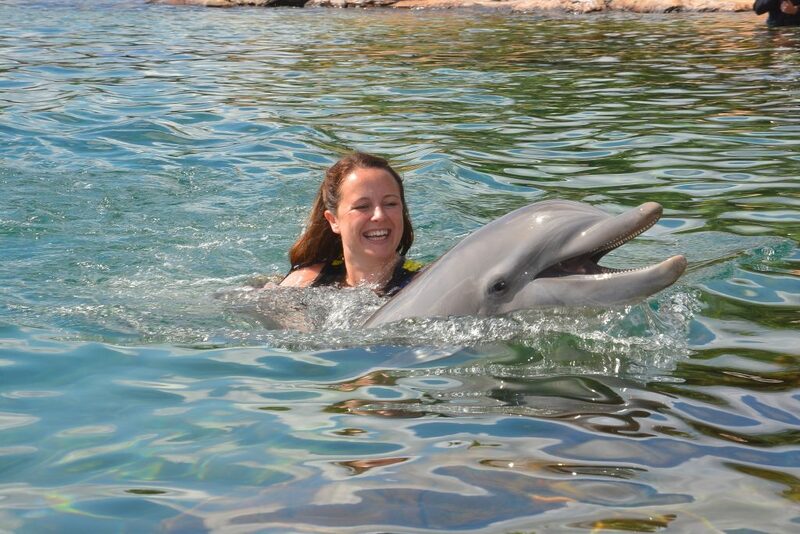 TOP TIP: You do not have to be able to swim to take part in a Discovery Cove Dolphin Interaction. You can request that your whole experience takes place in shallow water. The minimum age is three years old. 8pm: DINNER. It was our last evening so we celebrated with a fancy dinner at Emerils Orlando at CityWalk. This restaurant is owned by celebrity chef Emeril Lagasse and mimics the award-winning cuisine from his restaurant in New Orleans. Creole cooking is his specialty but the steak was fantastic too. If you are staying at a Universal Orlando Premier resort then guests actually get priority seating here and at a number of other restaurants at CityWalk and the parks. Then, for the adults in our group there was time for a bit of super karaoke at the Rising Star bar, where some of the singers genuinely have American Idol-level voices. 4pm: DINNER: To go out in true Yankee style we had lunch at the Hotdog Hall of Fame at Universal CityWalk. My favourite was the relish-covered Boston dog. Then, it was literally ‘go hard before we go home’ so we stopped for dessert at the Toothsome Chocolate Emporium, a crazy ice cream factory with ‘eccentric’ and slightly annoying servers, but delicious sweet treats! Then, even though it felt as though we had just arrived, we had to squeeze the last of our souvenirs into the case and head to the airport for our flight home. I hope you enjoyed our 14-day Orlando Itinerary. Tweet us and let us know what you think and of course, SHARE our guide with your friends and family. Universal Orlando hotels EXPLAINED. 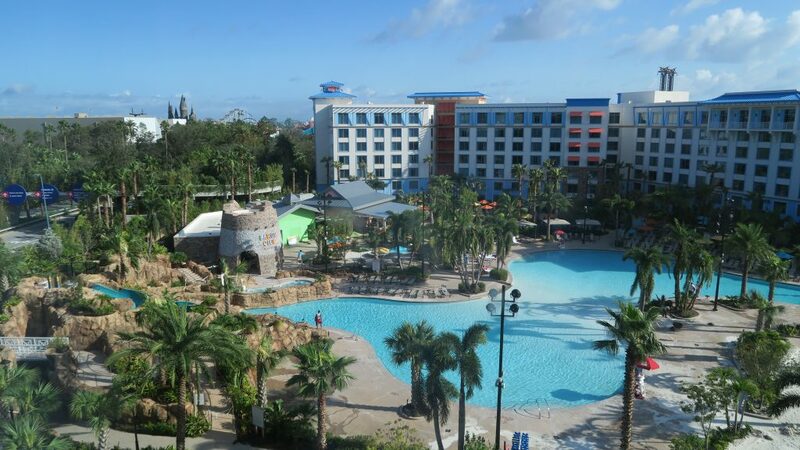 How to pick the best Universal Orlando hotel for your group. 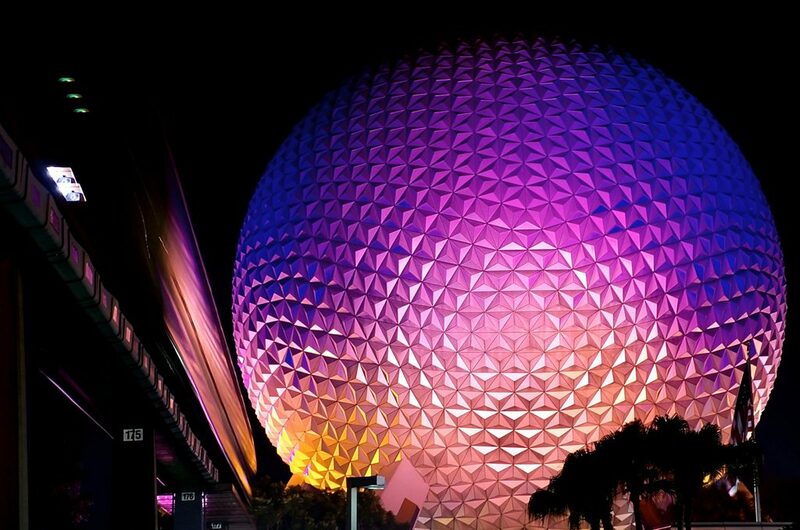 Where to get the best Instagram pictures at Walt Disney World. And, the best WALLS of Walt Disney World and where to find them.